With temperatures dropping and many women (such as myself) indulging in hot showers or turning up the thermostat, its no surprise that our skin gets dried out during the winter. During my teens and early twenties, I struggled to keep my skin free from flaking, breakouts and imperfections despite seeing a dermatologist. It's hard to look fabulous when feeling self conscious, let alone the last thing I want to stress out about (which can lead to breakouts too). Under the graceful wing of my esthetician, she has taught me the ways of keeping my skin looking fabulous during the winter (and year round) using Dermalogica's skin line. My sister, Alana, has asked me to write a guest post on YUP NYC to share how you can keep your skin looking flawless during the next few months of winter. 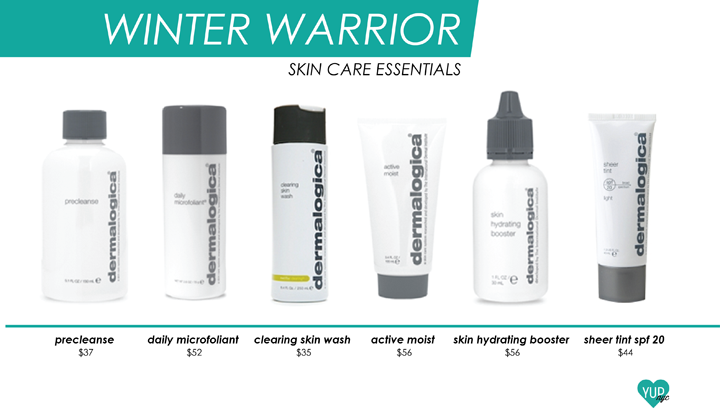 I start off my routine by removing my makeup with Dermalogica's pre cleanse. It is made of several types of oils (olive, kukui and apricot to list a few), which makes it easy to remove makeup. Simply add about a quarter size amount onto your palms and massage over your face and eyes. Once you massage your face (I love to concentrate on my eye area especially) wet your hands and continue to massage. Rinse your face with water afterwards. What I love about this product is that it gently removes the makeup from my face without drying my skin. After the pre cleanse, it is now time to exfoliate the skin. I'm not a big fan of using products with harsh exfoliants (I'm looking at you St Ive's Apricot Scrub!) so I prefer to use Dermalogica's Daily Microfoliant. I like this because it gradually exfoliates your skin and lightens up dark spots. Simply just add some of the powder onto the palm of your hand and add a little water to make it into a paste. Massage the paste onto your face and don't forget to concentrate on the side of your nose, which is notorious for harvesting dry skin. Now onto cleansing! I use Dermalogica's Clearing Skin Wash. If your skin is prone to break outs, I recommend their Derma Clay Cleanser which is what I started off with until my skin cleared up. Apply a pea size amount and massage face in circular motions. If you're using the Derma Clay, I like to let it sit on my face for a minute or two since it has a minty ting to it. Wash off product with warm water. Once our skin is clean, we definitely have to moisturize or else the skin will feel the need to over-produce oil which will leave your face feeling greasy. Dermalogica's Active Moist moisturize is great because it feels light and oil-free yet hydrates your skin. All you need to do is just apply about a dime size all over your face. If you need more moisture, adding in a drop of Dermalogica's Skin Hydrating Booster will solve that problem. Also, don't forget to wear sunscreen before you leave the house! Even though it doesn't look sunny outside, your skin is still exposed to uva rays. I love using Dermalogica's Sheer Tint Moisturizer with SPF 20 in dark since it can also be worn with concealer to hide imperfections. Want more skin care or makeup tips? Check out my blog at SPF 206! Great post.. Winter time needs more care of skin through the dry winds and you have shared truly expert tips. I think right supplements will also help to get healthy and beautiful skin because most of the skin problems happens due to the improper growth of human hormone. Thanks for sharing this informative resource with us.